Alexander von Humboldt – Prussian polymath, geographer, naturalist, explorer, and influential proponent of Romantic philosophy and science. 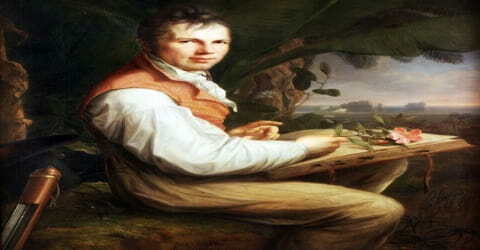 A German naturalist and explorer who was a major figure in the classical period of physical geography and biogeography areas of science now included in the earth sciences and ecology, Alexander von Humboldt was born in Berlin in Prussia on 14 September 1769. He was baptized as a baby in the Lutheran faith, with the Duke of Brunswick serving as godfather. With his book ‘Kosmos’, he made a valuable contribution to the popularization of science. The Humboldt Current off the west coast of South America was named after him. 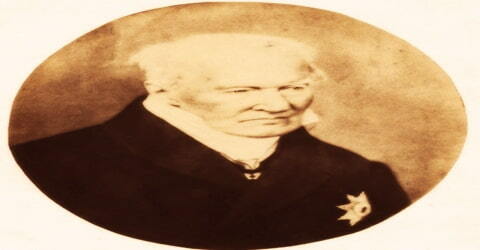 Humboldt was the younger brother of the Prussian minister, philosopher, and linguist Wilhelm von Humboldt (1767-1835). Humboldt’s quantitative work on botanical geography laid the foundation for the field of biogeography. Humboldt’s advocacy of long-term systematic geophysical measurement laid the foundation for modern geomagnetic and meteorological monitoring. Alexander von Humboldt, in full Friedrich Wilhelm Heinrich Alexander, Freiherr (baron) von Humboldt (German: ˈhʊmbɔlt), was born to Alexander Georg von Humboldt and Maria Elizabeth Colomb on 14th September 1769, in Berlin, in the historic state of Prussia. He had a sibling named Wilhelm. Humboldt’s father was an army officer who died when he was only 9 years old. Humboldt and his older brother, Wilhelm, were then raised by their mother, Maria Elisabeth Colomb. Alexander’s family belonged to a prominent Pomeranian family, and so they were able to afford private tutors to provide the boys a good education in mathematics, languages and classic. Less typically the brothers were also taught political history and economics. From his early childhood, Humboldt had a knack for observing and gathering specimens of plants, insects, and shells, and this earned him the nickname ‘the little apothecary’. Later, he enrolled at the ‘University of Frankfurt (Oder)’ as a student of finance for a brief period of time. Intending on a political career, Humboldt took courses in finance for six months at the University of Frankfurt in 1787. Then, for a year he studied at Göttingen University. During this time Humboldt developed an interest in botany, geology, and mineralogy. 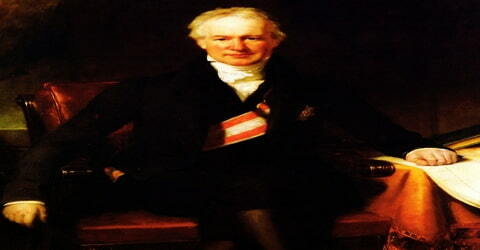 He met Georg Forster who had accompanied Captain Cook on his second voyage of discovery. Foster had a strong influence on Humboldt and they traveled across Europe and to England together. In 1789, he enrolled at the ‘University of Göttingen’ and the same year he embarked on an expedition to the Rhine River. During this trip, Humboldt wrote the piece ‘Mineralogische Beobachtungen über einige Basalte am Rhein’ (Mineralogic Observations on Several Basalts on the River Rhine). 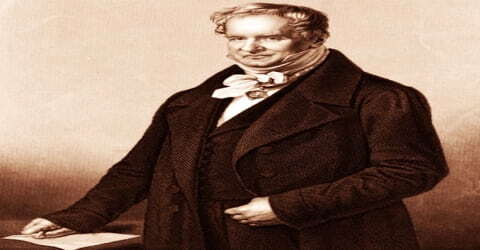 Alexander von Humboldt never married: while he was charmed by a number of attractive women, including Henriette, the wife of his mentor Marcus Herz, his sister-in-law Caroline von Humboldt stated: “nothing will ever have a great influence on Alexander that doesn’t come through men”. He had many strong male friendships, and at times had romances with men. His personal life is shrouded in mystery as reportedly, all his personal letters were destroyed by him. He had amassed some wealth and all these were given to his domestic helper Seifert, a few years before his death. Humboldt once wrote, “I don’t know sensual needs”. However, a pious travelling companion, Francisco José de Caldas, accused him of frequenting houses in Quito where “impure love reigned”, of making friends with “obscene dissolute youths”, of giving vent to “shameful passions of his heart”, and dropping him to travel with “Bonpland and his Adonis”(Monúfar). A year spent at the University of Göttingen, from 1789 to 1790, finally opened the world of science to him; Alexander von Humboldt became particularly interested in mineralogy and geology and decided to obtain a thorough training in these subjects by joining the School of Mines in Freiberg, Saxony, the first such establishment. Although founded only in 1766, the school had already acquired an international reputation. There, buttressed by a prodigious memory and driven by an unending thirst for knowledge, he began to develop his enormous capacity for work. After a morning spent underground in the mines, he attended classes for five or six hours in the afternoon and in the evening scoured the country for plants. Humboldt’s scientific excursion up the Rhine resulted in his 1790 treatise Mineralogische Beobachtungen über einige Basalte am Rhein (Brunswick, 1790) (Mineralogic Observations on Several Basalts on the River Rhine). Humboldt’s passion for travel was of long standing. Humboldt’s talents were devoted to the purpose of preparing himself as a scientific explorer. With this emphasis, he studied commerce and foreign languages at Hamburg, geology at Technische Universität Bergakademie Freiberg in 1791 under A.G. Werner, leader of the Neptunist school of geology; from anatomy at Jena under J.C. Loder; and astronomy and the use of scientific instruments under F.X. von Zach and J.G. Köhler. At Freiberg, he met a number of men who were to prove important to him in his later career, including Spaniard Manuel del Rio, who became director of the School of Mines the crown established in Mexico; Christian Leopold von Buch, who became a regional geologist; and, most importantly, Karl Freiesleben, who became Humboldt’s tutor and close friend. During this period, his brother Wilhelm married, but Alexander did not attend the nuptials. In 1792, Humboldt got a mining job at Berlin and was posted as assessor of mines. He worked exceptionally well and soon moved up the ranks in the department. Many diplomatic undertakings were also assigned to him. From 1792-97, this explorer had settled in the Austrian city of Vienna and in between embarked on a short trip to Italy and Switzerland. At the mining department, he worked rigorously from morning to evening and amassed immense knowledge in this field. In 1793, Humboldt published a book named ‘Florae Fribergensis Specimen’ based on his study of the flora in the mines. 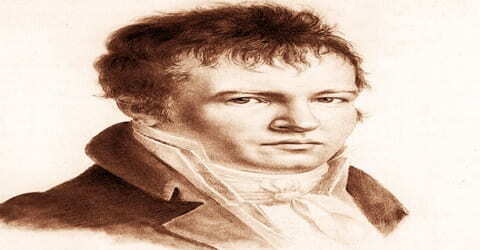 In 1794, he was inducted in the coterie of Weimer and the following year, his article named ‘Die Lebenskraft, oder der rhodische Genius’ was published in the periodical ‘Die Horen’. Humboldt’s mother died when he was 27, in 1796 and this left him a good inheritance which would pay for his future explorations. A year after his mother’s death, he left government service and planned his travels with the botanist Aime Bonpland. Humboldt had always wanted to travel and explore and he seized his chance. Together with Bonpland, they traveled to Madrid to obtain the special permission needed at that time to explore South America. Humboldt’s social standing assured him of access to official circles, and in the Spanish prime minister Mariano de Urquijo, he found an enlightened man who supported his application to the king for a royal permit. In the summer of 1799 he set sail from Marseille accompanied by the French botanist Aimé Bonpland, whom he had met in Paris, then the liveliest scientific center in Europe. The estate he had inherited at the death of his mother enabled Humboldt to finance the expedition entirely out of his own pocket. Humboldt and Bonpland spent five years, from 1799 to 1804, in Central and South America, covering more than 6,000 miles (9,650 kilometers) on foot, on horseback, and in canoes. It was a life of great physical exertion and serious deprivation. They then traveled to Ecuador and Lima in Peru, which was the end of this voyage. As the discoverer, Alexander is the eponym for Peruvian current, which is commonly known as the ‘Homboldt Current’. During his journey through the American regions, the transit of the planet Mercury was perceived by him and he also understood the fertilizing qualities of the dung of the seabird known as guano. These explorers also chanced upon the electrical properties of the eels during the expedition. After a short stay in Cuba, Humboldt and Bonpland returned to South America for an extensive exploration of the Andes. From Bogotá to Trujillo, Peru, they wandered over the Andean Highlands following a route now traversed by the Pan-American Highway, in their time a series of steep, rocky, and often very narrow paths. They climbed a number of peaks, including all the volcanoes in the surroundings of Quito, Ecuador; Humboldt’s ascent of Chimborazo (20,702 feet (6,310 meters)) to a height of 19,286 feet (5,878 meters), but short of the summit, remained a world mountain-climbing record for nearly 30 years. After the completion of this long and experimental journey, he traveled to the United States and paid a visit to President Thomas Jefferson, who was also a scientist. He spent some quality time with the president and both gained from the others knowledge. He traveled to Europe after his brief stay in the White House. He went to Paris where he spent the following twenty-three years of his life. 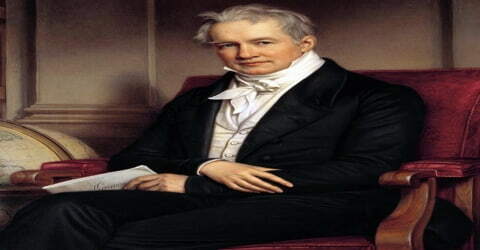 From 1804 to 1827, he was engaged in writing scientific pieces which encompassed his experiences in discoveries during the voyage of American regions. He published around thirty volumes of such pieces during this period. Gradually, the fortunes which he had inherited from his mother were exhausted and Alexander then became an advisor to the Prussian King in order to earn a living. Humboldt kept a detailed diary of his sojourn to Spanish America, running some 4,000 pages, which he drew on directly for his multiple publications following the expedition. The leather-bound diaries themselves are now in Germany, having been returned from Russia to East Germany, where they were taken by the Red Army after World War II. Following German reunification, the diaries were returned to a descendant of Humboldt. For a time, there was concern about their being sold, but that was averted. A government-funded project to digitize the Spanish American expedition, as well as his later Russian expedition, has been undertaken (2014-2017) by the University of Potsdam and the German State Library Prussian Cultural Heritage Foundation. In 1827, Humboldt traveled to Berlin and began to give public speeches, which earned him immense fame. Eventually, he made up his mind to pen all his experiences during all these years, and share his knowledge about the earth and nature, and began working on his greatest work. These lectures became so popular that he decided to write all his research in a work which he called the “Kosmos”. The first volume was published in 1845 when he was 76 years old. Five volumes in total were published, the final volume posthumously. The first centenary of Alexander von Humboldt’s birth was celebrated on 14 September 1869, with great enthusiasm in both the New and Old Worlds. Numerous monuments were constructed in his honor, such as Humboldt Park in Chicago, planned that year and constructed shortly after the Chicago fire. Newly explored regions and species named after Humboldt, as discussed below, also stand as a measure of his wide fame and popularity. His book ‘Kosmos’ can be regarded as one among his greatest works where he instilled all his knowledge about natural science. He collected much data during his life and advocated that all the physical science such as meteorology, biology, and geology have an interrelated relationship. His remains were conveyed in the state through the streets of Berlin, in a hearse drawn by six horses. Royal chamberlains led the cortège, each charged with carrying a pillow with Humboldt’s medals and other decorations of honor. Humboldt’s extended family, descendants of his brother Wilhelm, walked in the procession. Humboldt’s coffin was received by the prince-regent at the door of the cathedral. He was interred at the family resting-place at Tegel, alongside his brother Wilhelm and sister-in-law Caroline. Some of the geographical features and places named after him include ‘Humboldt Bay’, ‘Humboldt River’, ‘Pico Humboldt’, Humboldt Sink’, ‘Sima Humboldt’, ‘Humboldt Falls’, Hacienda Humboldt’, ‘Humboldt Kansas’, ‘Humboldt, Illinois’, ‘Humboldt Arizona’ and ‘Alexander von Humboldt National Forest, Peru’. The astronomical features named after this famous geologist are ‘Mare Humboldtianum lunar mare’ and ‘asteroid 54 Alexandra’. Many school and colleges have also been named after Humboldt.